Last year, Microsoft and Dropbox announced a partnership meant to lead to tight integration between the cloud storage service and the software giant’s Office suite. This went live for mobile apps shortly afterwards, but only today has it been launched for Office Online. You can now edit any Word, PowerPoint, or Excel file in Dropbox in your Web browser. All the changes you make will automatically be saved to your Dropbox. So you can now work on the documents you have stored in your Dropbox even without having the offline Office apps installed on your computer. 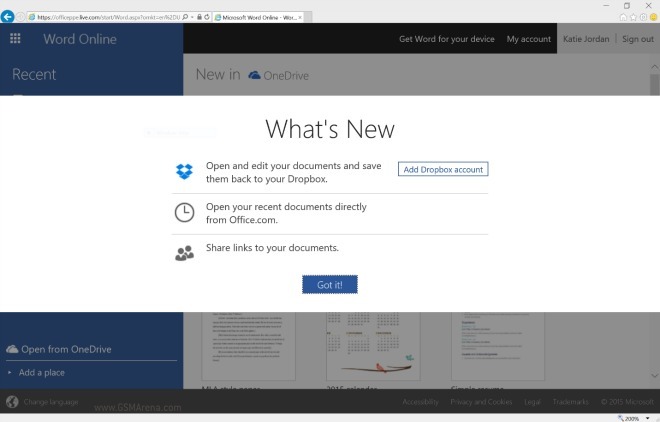 At the same time, you’re now able to access your Dropbox storage from Microsoft’s Office Online platform. After adding your Dropbox account, this lets you choose a file stored in Dropbox for editing on Office Online. And, as you may have expected, the changes are then seamlessly saved to Dropbox.